Sports minister Hugh Robertson today denied any responsibility for the school sport cuts - yet claimed credit for the school games, reports Shamik Das. Sports minister Hugh Robertson today denied any responsibility for the school sport cuts – yet claimed credit for the school games, which are very much part of the government’s school sport strategy, designed to increase participation in competitive sport. In Culture, Media, Sport and Olympics Questions in the Commons this morning, following a question from Tracy Crouch (Conservative, Chatham and Aylesford) about the lack of media coverage of women’s sport (a subject covered by Left Foot Forward in January), shadow culture secretary Harriet Harman grilled him on the impact of the school sport cuts, describing school sport as “the bedrock of participation”, something that “should be a priority”. 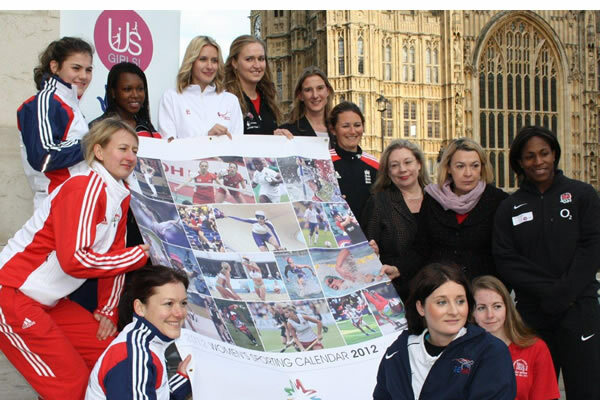 So Robertson’s message appears to be the DCMS is in charge of the School Games, with the DfE responsible for school sport, and by definition competitive school sport (which he and his department have an awful lot to say about), and to blame for the cuts – issues that were all raised later in the session. 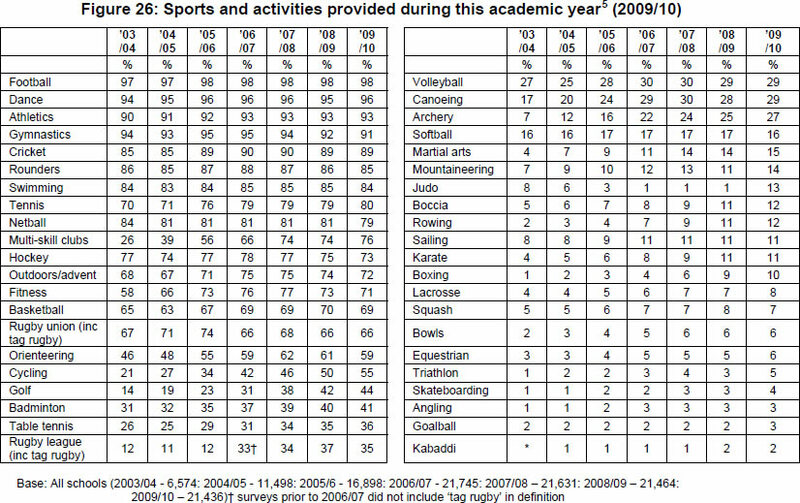 “The person who launched School Games was the Secretary of State for the Department of Culture, Media and Sport, not the Department of Education, now they have been using a figure of one in five children involved in inter-school competitive sport and they will know that that figure comes from the PE Sports Survey carried out of schools every year and that that figure is measured on the basis of children taking part in nine competitive sport events against other schools in a school year. 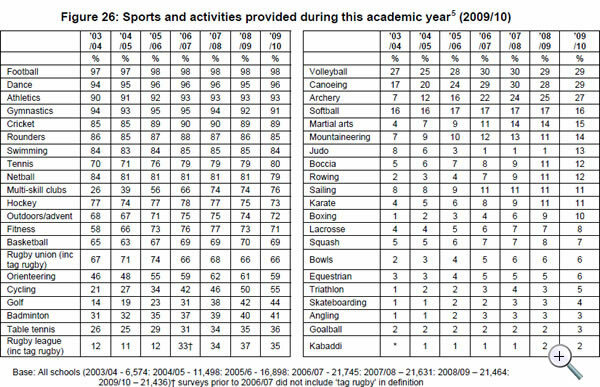 So there, it looks like, we have it – the “cadre” of people for whom the DCMS is responsible for is those aged 16-25 (or 16-24 according to Robertson’s earlier answer to Harman), the department responsible for the School Games is apparently only responsible for sport for 16-25 year olds, and seemingly takes no responsibility for school sport, or for the scrapping of the PE and Sport Survey. What, then, of the figures of falling participation Robertson and Hunt cite? 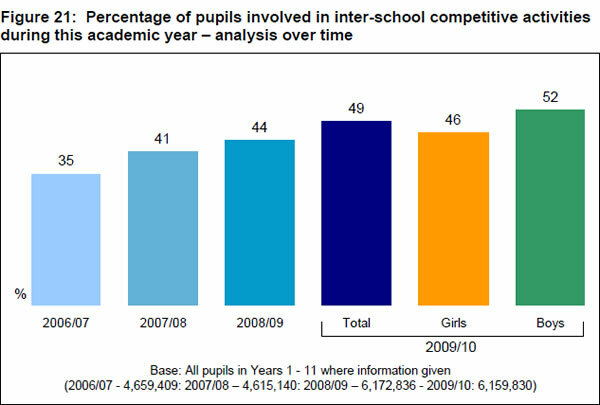 For 16-25 year olds overall that may be so, but for school children, the same children and age groups at which the School Games are aimed, talk of falling participation under the last government is simply not backed up by the evidence of the soon-to-be-abolished PE and Sport Survey. 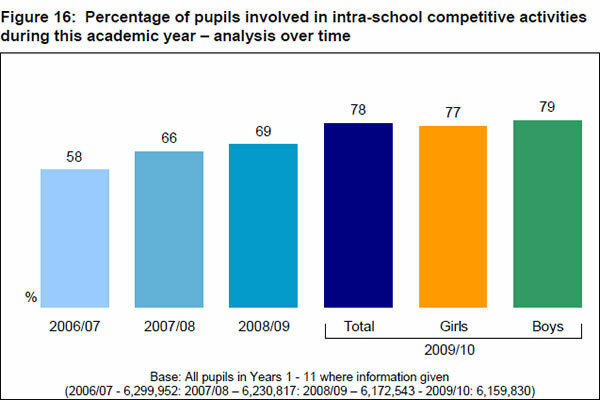 • 21% of pupils across Years 3 – 13 regularly participated in inter-school competition during 2009/10, a small increase from 19% in 2008/09. What Parliament witnessed today was disjointed government at its worst, the separation of powers over school sport, the passing of the buck on school sport cuts, ministers ducking responsibility, one department in charge of the School Games, another with departmental responsibility for school sport, the scaling back of programmes that were delivering more competitive school sport and increased participation, and, to compound these follies, the abolition of the PE and Sport survey.